The Italian container ship “Grande America” sank off the French Atlantic Coast last week after a fire broke out. All 27 crew members were able to evacuate before it sank, but over 2,000 cars, allegedly including a shipment of the Porsche 911 GT2 RS, didn’t make it. Carscoops reports the ship was carrying a shipment of Audi A3, A5, RS4, RS5, and Q7 models, as well as some Porsche Caymans, Boxsters, Cayennes, and reportedly four 911 GT2 RS models. A letter sent to Carscoops appears to be from Porsche Brazil to a 911 GT2 RS customer, informing them that Porsche will put the car back into production to replace the car that was on the sunken ship. 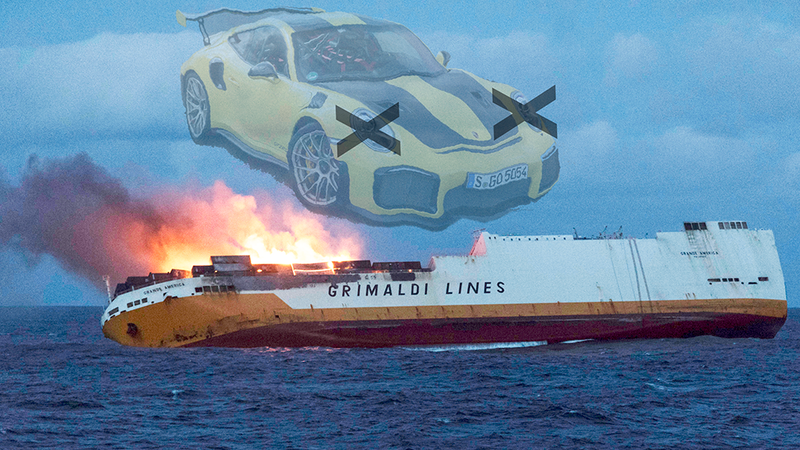 ”We are sorry to inform you that, due to a fire, a Grimaldi group ship, that was transporting your vehicle, sinked on March 12, 2019. And for that reason, your GT2 RS can not be delivered. Porsche Brasil confirms that 37 of its new cars, in route from Hamburg, Germany to Santos, Brazil, were aboard the vessel Grande America that suffered a maritime incident near the coast of Brest, France, on March 12, 2019. Update, March 20, 10:00 a.m.: An Audi spokesperson confirmed to Jalopnik that a “small number” of Audi vehicles destined for the Brazilian market were onboard the ship. The fire is believed to have started on the car deck, according to Jean-Louis Lozier, head of the regional maritime authority in France, via France 24. French crews have been cleaning up oil slicks in the ocean, which are leaking from the ship that’s resting at a depth of about 4,600 meters, or about 15,000 feet. Sadly, it’s not exactly like you’re going to go diving for a 911 GT2 RS and come up with something salvageable, if you’re getting any ideas. Authorities seem to believe that most of the contents of the ship burned up in the fire. But you never know, maybe it’s still worth a shot.